I’m not much of a sweet baker anymore since I’ve been trying to cut sugar out of my diet. 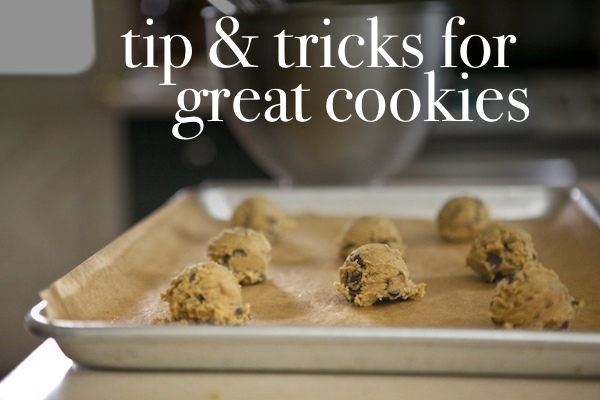 That being said, I used to bake cookies on occasion and since I’m never satisfied and continue to try new thing, I came across a few tips & tricks I’d like to share about how to make your cookies even better. We all have our personal taste when it comes to how we like our cookies, chewy, crunchy, a little of each. My go to cookie recipe is David Lebovitz’s Salted Butter Chocolate Chip Cookies. It’s a small batch, only making about 2 dozen cookies – so double if you want some extras! I also use this recipe from Nosh With Me on occasion, which makes a BIG batch which I bake over the course of a week (see below). Use large flake sea salt – when you use large flake salt instead of fine grain salt you’ll get a little burst of saltiness every now and then when eating a cookie. It’s akin to the joy that is salted caramel, that burst of salt paired with the sweet is truly heaven! Chill your dough for at least 24 hours before baking, 48-72 is even better. REALLY? Yes, believe me. You’ll be amazed at how much better the cookies will bake and taste when you age the dough a bit. I’m not sure what magic happens in the cold dark depths of the fridge overnight but you’ll never look back. 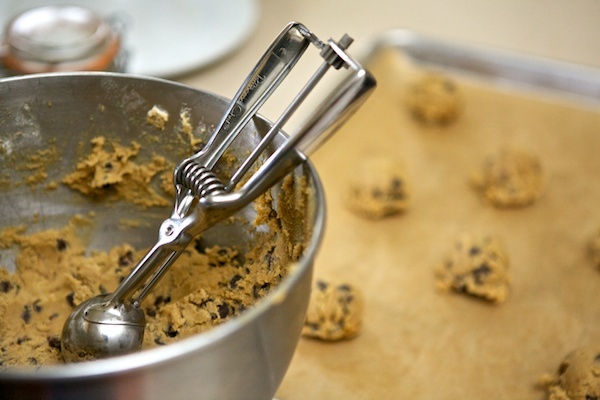 Usually I bake one tray the first night – I know – but really who can make cookie dough and not bake some? Then I bake 8 cookies the next night, then 8 again, and so on until the dough is gone. Usually I can get 5 trays of cookies from one batch of the Nosh With Me recipe. This also helps with the overeating of cookies – you won’t be tempted to eat more than you want to because you only baked up a few. 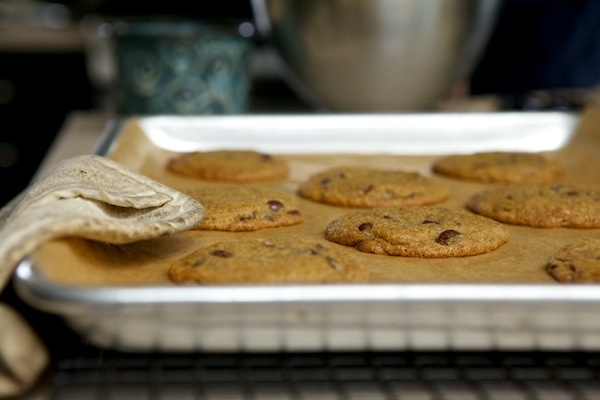 If you like your cookies on the chewy side remove from the oven before you think they’re done and let them sit on the cookie sheet for a minute or two. This will bake them further but won’t make them as crispy as if you baked them the rest of the way in the oven. Use powdered sugar instead of flour for rolling out gingerbread, butter, or other rolled cokies. You won’t get that floury taste and the surface of the cookie will be beautiful and shiny instead of white and dusty. What’s your favorite kind of cookie? 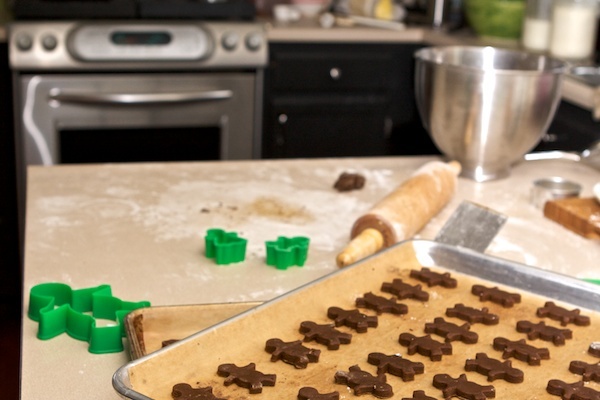 Any great cookie baking tips to share? The cookie dough is in the fridge! I’m trying David Lebovitz’s Salted Butter Chocolate Chip Cookies. Can’t wait to try them. I’m not much of a cookie baker (or biscuits as we Brits call them!) aside from the ginger biscuits I made using a recipe my father in law gave me. I wonder what difference it would make to chill that dough for longer. I gave cookies on my list of culinary challenges this year. Thank you for the great tips on cookies. My hubbie is a chocolate chip cookie fiend and I have spent years expiermenting with it. I have never heard the powdered sugar tip for rolled cookies either. Great ideas!